HomeForumGeneral Discernment Board- Question…Announcing New Webinar on Dating! Have you ever thought this when you got the news that a friend was getting a divorce? Hindsight is always 20/20, of course. But while it is easy to talk about what led to a divorce, it can be a lot harder to tactfully warn a person first in love and ready to march to the altar that they might be in an unhealthy relationship. Harder still, is to recognize when the person in the unhealthy dating relationship is yourself. Why? At times, serious red flags can be subtle. They sneak up on you, as it were. Other times, we do recognize a red flag but minimize its importance and negative impact on marriage. Sometimes this is because of inexperience. Or, in other cases, it can be the result of an overly optimistic hopefulness. Frequently, our friends or family members can spot potential problems but they don’t feel comfortable in being the “wedge” between you and the person you are dating, and hold their tongue. The list can go on and on. But, the bottom line is that with the divorce rate skyrocketing, we need every help we can get to beat the odds and go for a healthy, long-lasting marriage with a well-rounded spouse. Yet, we do a lot to sabatouge this for ourselves. In today’s world, we spend a huge amount of time and attention to planning romantic dates or a vacation or even a wedding. Sadly, most people take little time or effort to seriously discern whether to get married, to prepare themselves to be a good spouse, and to realistically assess the other person’s attitude and readiness for a mature Christian marriage. This of course leads to problems down the road. Many of these problems could have been prevented or nipped in the bud if people knew the red flags to look for while dating! 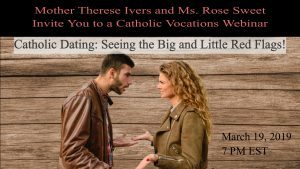 If you are dating, thinking about dating, or know people who are dating, you are cordially invited to a free webinar hosted by Mother Therese Ivers. Her guest speaker will be Ms. Rose Sweet who will be giving an in-depth look on some of the red flags to be watching out for when dating. Ms. Sweet has gained a lot of insight into how romantic relationships can be quickly soured by unhealthy dynamics in her apostolate of working with divorced people. Ms. Sweet is a recognized author and speaker, and she has graciously agreed to participate in a question and answer period after her presentation. You can join M. Therese and Ms. Sweet on March 19 at 4pm PST (7 pm EST) by signing up at this link here.